I have already gone on and on about how genius I think the Ottolenghi cookbook is but I haven’t mentioned how truly madly deeply I have fallen for the baking and patisserie section. 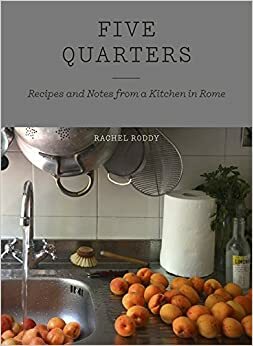 Full of mouth-watering and fat-inducing recipes like caramel and macadamia cheesecake, lime and basil macaroons and meringues aplenty. 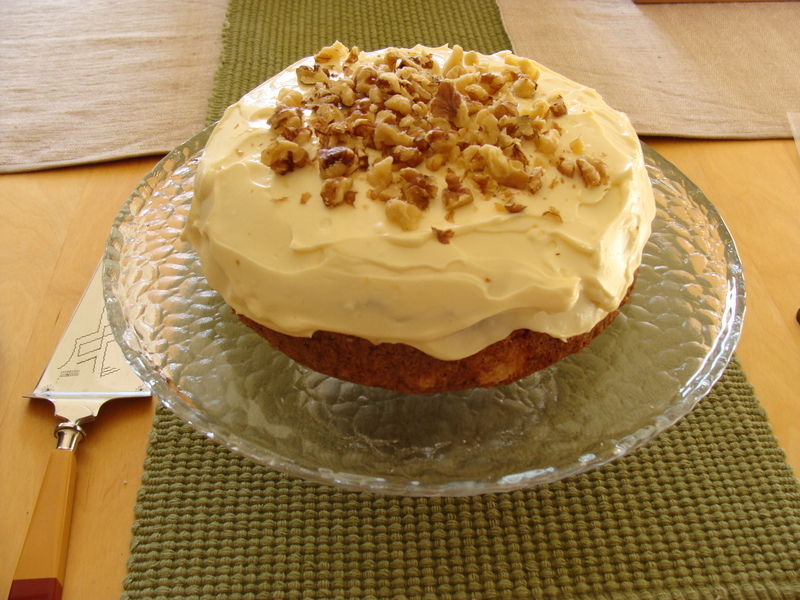 The next thing I am planning to try is the apple, olive oil and maple cake but I couldn’t resist trying out the carrot walnut cake first. I worship Philadelphia cream cheese. I think it is the best—it doesn’t matter how fatty it is considering it is all worth it for the silky creamy taste. Don’t even try to use the 2% less fat version as no good cream cheese icing is going to taste as good without that extra kick of fat. One thing to note about the recipe is that it could be slightly sweeter and spicier. I would up the amount of cinnamon and maybe add a little ground cardamon but don’t add more ground cloves as it will leave a bizarre aftertaste in the mouth like you have just been to the dental hygienist. 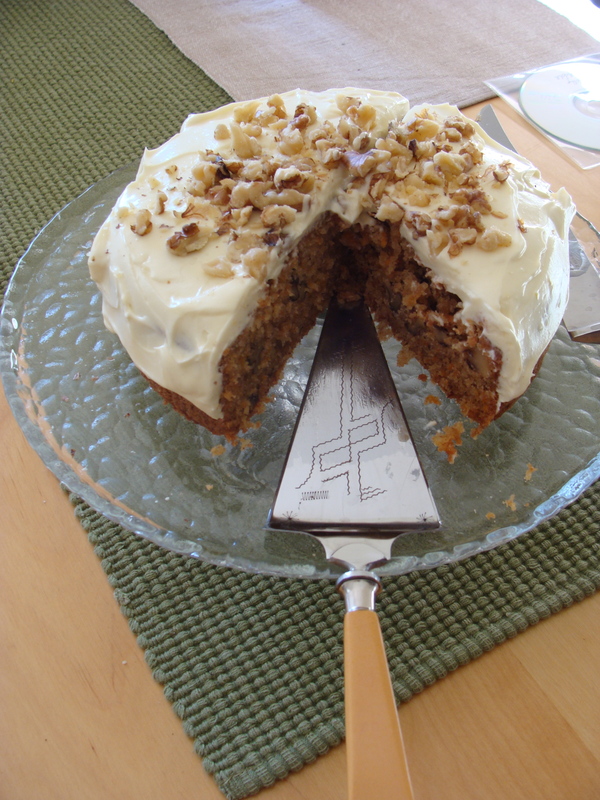 This cake isn’t heavy or cloying like some and it isn’t a dense and incredibly moist one—it is more like the light and more demure cousin of the typical carrot walnut cake. Preheat the oven to 170°C. Grease a 20cm springform cake tin and line the base and sides with baking paper. Sift the flour, baking powder, bicarb soda and spices together. Lightly whisk the whole egg with the egg yolk. Put the sunflower oil and caster sugar in a bowl and beat for a minute on medium speed. On a low speed, add the beaten egg. Mix in the walnuts, coconut and carrot and then the sifted dry ingredients. In a separate bowl, beat the egg whites with the salt on high till it forms firm peaks. Gently fold the egg whites into your carrot mixture in three additions, don’t overmix. Pour the mix into the tin and bake for about an hour or so. Test for doneness by inserting a skewer and if it comes out dry (or close to dry) it is done. Let the cake cool. Make the icing by beating the cream cheese till light and smooth. In a separate bowl, beat together the butter, icing sugar and honey and mix till light and airy. I accidentally used salted butter and it was a bit salty so I added lemon zest and a tiny bit of lemon juice to counter the salt. Fold the cream cheese into the butter mix and spread on to the cake. Sprinkle with nuts. Recipe adapted from Ottolenghi: the cookbook (Ebury). Aubergines are a gift to all vegetarians. I eat mainly vegetarian and have no qualms or prejudices, but seriously, nothing beats a good sea bass or roast beef fillet. Normally it is quite hard to find great and I mean GREAT vegetarian dishes but now that Ottolenghi has emerged it seems that we are spoilt for choice. I have noticed that Yotam Ottolenghi and Sami Tamimi love using aubergines in their recipes. This is a fabulous thing as everyone loves a good aubergine. Aubergines are great. They are especially tasty when drenched in butter or soaked up with oil. Mmm oil. Ottolenghi: The Cookbook really should have been included in the Observer Food Monthly’s 50 best cookbooks of all time issue (Aug 2010). The list, although it included many great cookbooks, didn’t seem as comprehensive as it could have been. Madhur Jaffrey has so many interesting and flavourful cookbooks, and the one and only included was her An Invitation to Indian Cookery, when I think the Ultimate Curry Bible is her best one yet—her cooking isn’t solely Indian cookery. 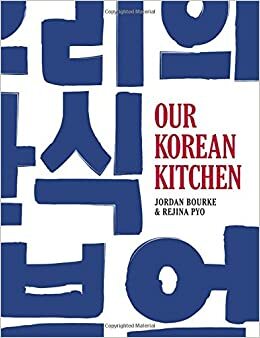 Everyone I am sure will have their two cents to add about what was left out, but it was a really interesting read and OFM did pull out some obscure cookbooks and opened my eyes to ones I hadn’t thought to look at. Since recently moving to the ‘big smoke’ of London, I thought it was a necessity that we visit the flagship Ottolenghi based in Islington. As to be expected, the place was stunning: huge colourful meringues and beautifully tasty apple maple cakes on display. I was drooling as soon as I stepped in the door. I had to order the famous beef fillet—and was an instant convert, especially so because I love my red meat on the rare side. 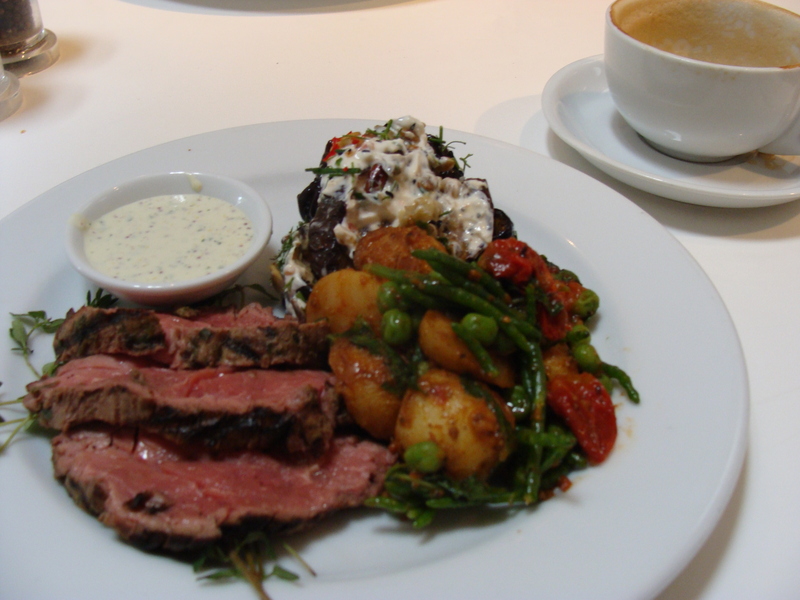 I also had an amazing samphire and baby new potatoes salad that was coated in extra virgin olive oil and some sumac. Of course I had to get the roasted aubergine salad which was mixed with tahini … mmm it was a mighty good day that day. 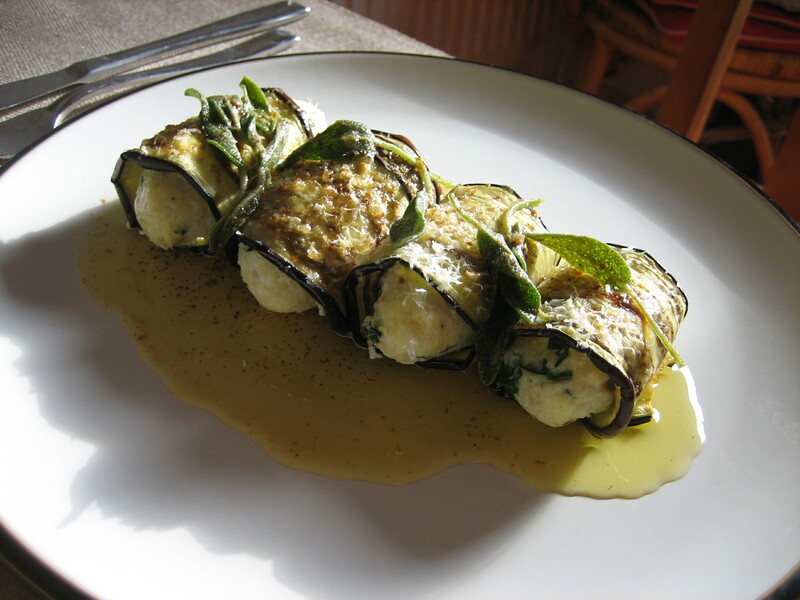 Aubergine-wrapped gnocchi takes a bit of planning in advance. I (at times regretfully) never seem to read the recipes through before starting them. I always find something to make, post-it note it then compile my market list of what I need to buy for it. The reading of the recipe is done when I am already in the kitchen, an hour before I hope to eat dinner. For this dish that was a bit of a shame as we didn’t get dinner till really really late. The recipe should be started ideally the night before but 4 hours in advance will do. The thing I found about the dish is that if you don’t slice the aubergine slices uniformly and neatly the end result won’t look so appetising! But it will always taste absolutely fabulous. 1. Dry roast the pine nuts till golden in colour. Transfer to a bowl and add ricotta, egg yolks, flour, parmesan, herbs, nutmeg and salt and pepper. Stir well and cover, refrigerate for at least 4 hours or overnight. 2. Preheat the oven to 180°C. Cut the aubergine lengthways into 5mm-thick slices. Lay on to a baking tray and brush with oil. Roast in the oven for 15-20 mins or until the aubergine is tender and golden. You could always chargrill them instead. 3. Shape gnocchi and roll into 8 or 12 long balls. Bring a large pot of salted water to the boil and drop a few dumplings in at a time. When they rise to the surface this means they are done, take them out and drain on kitchen paper, then brush them with the melted butter. 4. 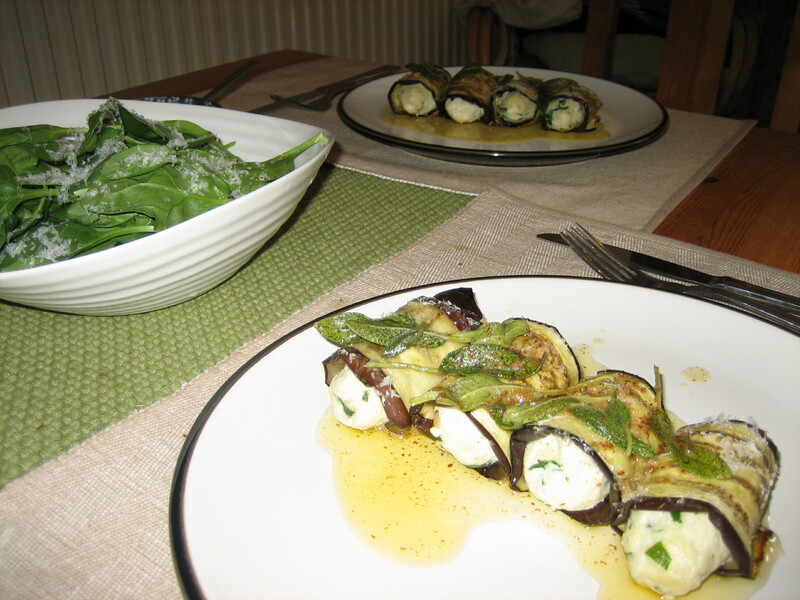 When the gnocchi has cooled down, wrap the aubergine piece around one and do the same with all other gnocchis. Place them into a greased oven dish and sprinkle with Parmesan. Place them into the oven 10 mins before serving time giving them about 10 minutes in the oven to heat through. 5. To make the sage butter, put the butter into a pan over a moderate heat. Simmer for a few minutes until the butter turns a light golden brown, remove from heat and immediately add the sage, salt, lemon juice. Return the pan to the heat, giving it a few seconds to cook lightly. Serve gnocchi with the sage butter drizzled on top. Recipe from Ottolenghi: The Cookbook (Ebury Press).